Pecan nut butter is made through roasting usually split pecan nuts, removing the skin and germ and then milling the roasted nut down into a butter while optionally adding items like salt, sugar, spices, chocolate, cocoa, emulsifier and additional oil should the nut be low on oil or due to economic reasons. 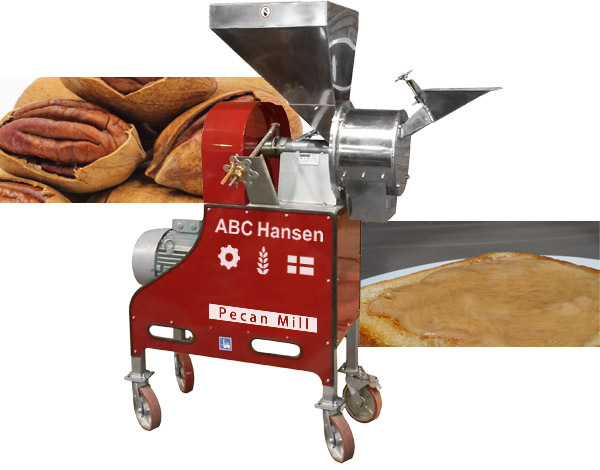 When pressing pecan oil (this equipment is also supplied by ABC Hansen) the oil cake may be milled and used in various preparations such as in pecan pies, praline candy and other confections. Pecan oil is edible and healthy it being rich in mono-saturated fats. It has a very high smoke point on 203 degrees C. the mild nutty flavour enhances the flavour of other ingredients. Prior to mechanical expelling, the nuts are lightly roasted. (This equipment is also supplied by ABC Hansen). ABC Hansen supplies all equipment in this process in various capacities namely roasters operating with gas, electricity and diesel / industrial oil, de-skinners / blanchers (for split nuts and also for snack nuts). The heart of the system is of course the Universal mill with plate attachment. Each mill can process more than 240kg of pecan nut butter per hour with 11kw motor and the plant can be scaled to the buyers’ requirement. The butter can have a fine and smooth texture or a crunchy texture depending on how the operator sets the machine. Both sides of the plates can be used for milling.